For years I have wanted to have the kind of house where guests walk in and see a beautiful dining table, all dressed with coordinating plates, cutlery, placemats and napkins. A design that looks stylish yet functional. Our dining table often looks like a storage facility, housing books, toys, notepads, laptops and receipts. I’ve decided we will never be people who always have their table “dressed”, and that’s okay, but wouldn’t it be nice if you could quickly set up your table for company and have it look put together? That was my mission over the last 12 months. 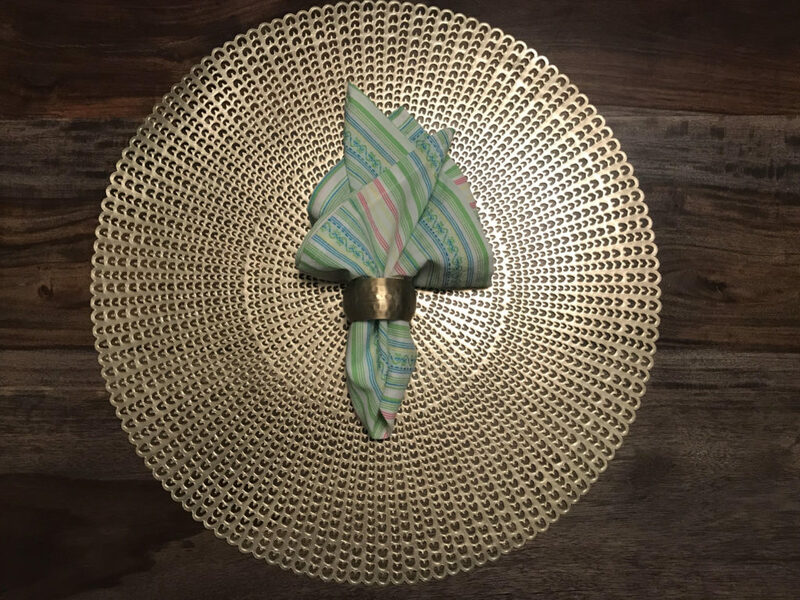 But could I find placemats, napkins and napkin rings that I liked? Not a chance. On a recent trip to Bed, Bath & Beyond I found placemats and napkin rings that I quite like, but the thought of spending a lot of money on cloth napkins just didn’t thrill me. We have 9 settings in our house so with most store-bought napkins ranging from $4- $12, I decided I should DIY it. I looked up standard napkin sizes and it looks like anywhere from 12″ to 16″ is where I wanted to be. I went to Fabricville and found some cute, summery fabric on clearance. 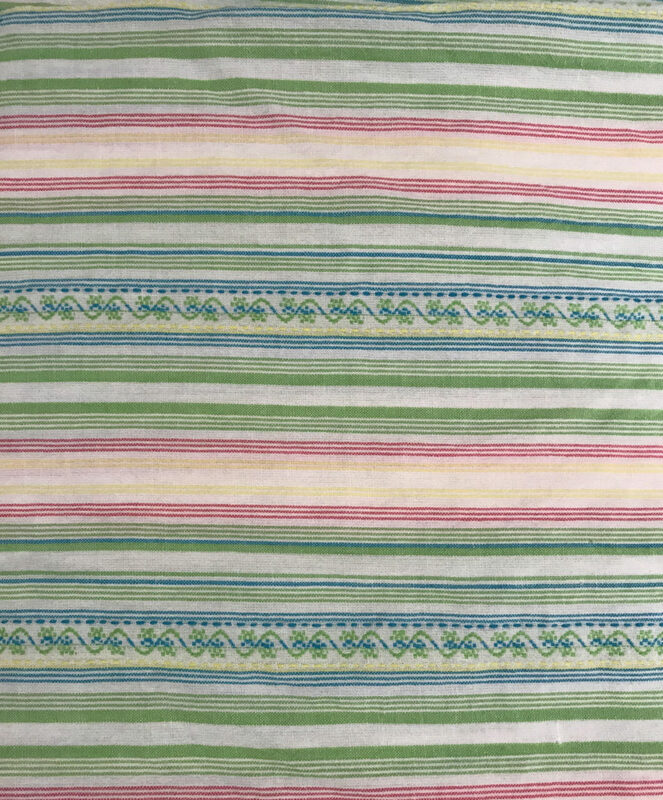 I chose this fabric because it’s the same on both sides. As much as I love working with cotton, printed cotton always has a “wrong” side and it usually isn’t very pretty. This fabric almost feels a bit gauzy, and it has a little bit of stretch to it. I came home and put this fabric through the washer (hot water) and dryer. If these are going to shrink, I want them to shrink now. And I figure cloth napkins are something I will probably need to wash in hot water because of the potential for stains, mostly from tacos. I decided to go for 14″ napkins, so I started out by pressing my uncut fabric with the iron to get out any wrinkles. Because this fabric is striped, I needed to cut fairly straight along the stripes. I used my rotary cutter and cutting mat for this, but you can use scissors and a tape measure/ruler as well. 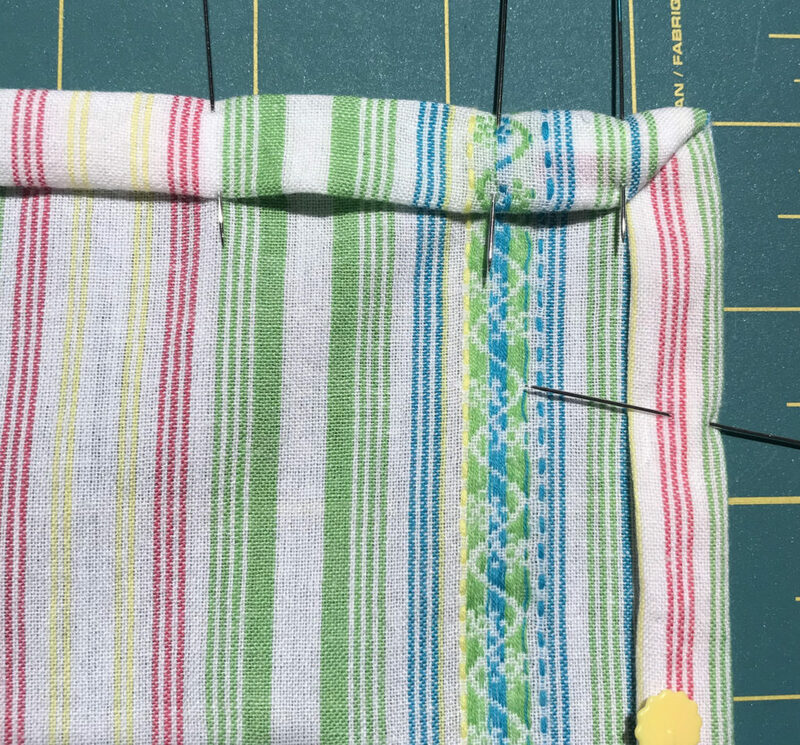 If you’re using scissors, an easy way to do this is to cut out a piece of cardboard in the proper dimension, and lay the cardboard on top of your fabric. Outline it with a pen or a Sharpie. Do that for each napkin, then remove the cardboard and simply cut out. 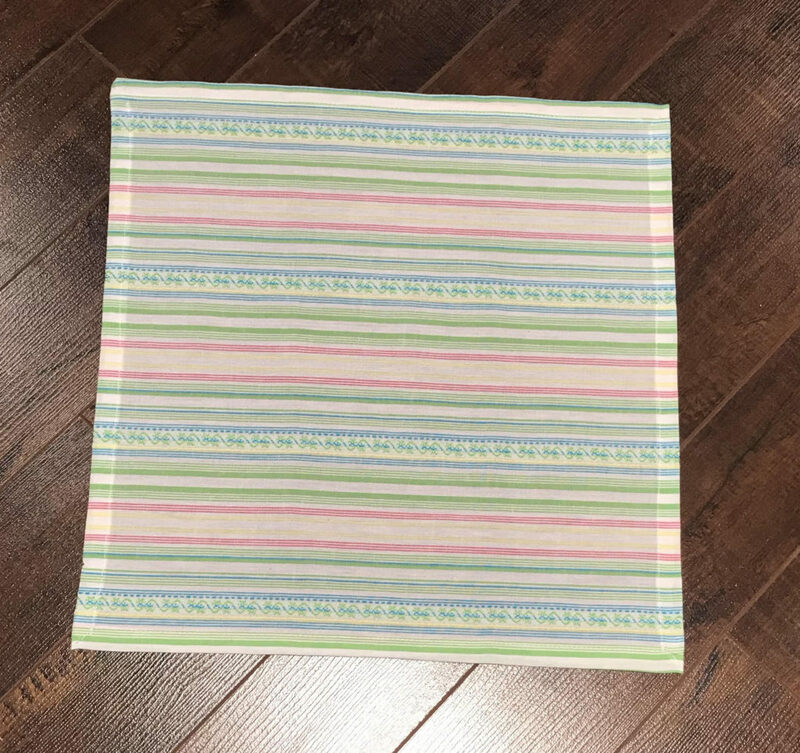 I wanted a nice, crisp sewn edge for these napkins so I actually cut 16″X16″ squares to account for a 1″ seam allowance. 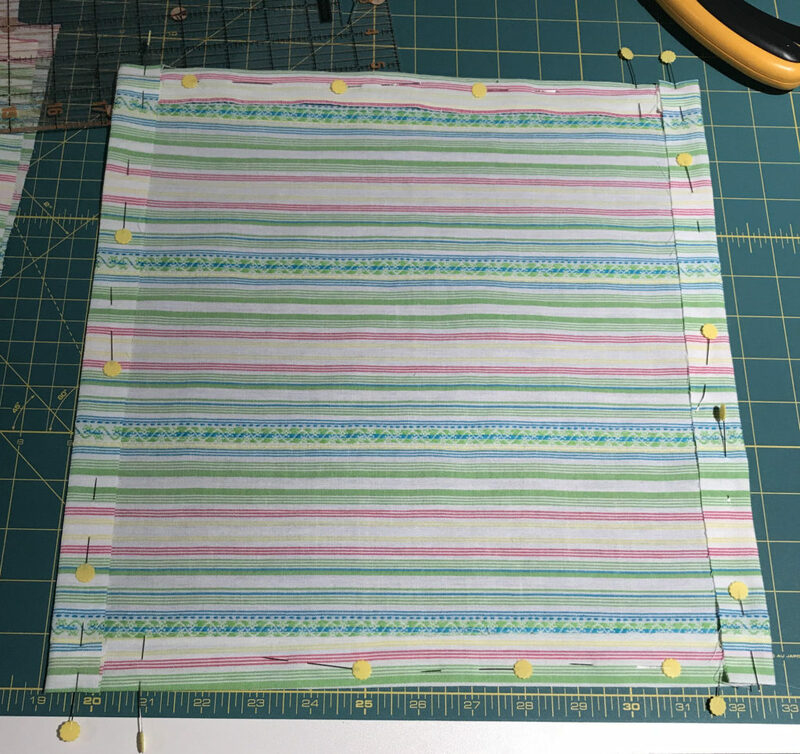 Once cut, I folded in the edge 1″ all the way around, pinning as I went. I pressed the crease with a hot iron and let the fabric cool. Once cooled, I took out the pins and tucked in the seam allowance so no raw edge was exposed. I pinned in place. As this fabric does have stretch, I was sure not to stretch as I pinned. Doing so would leave the edges of the napkin “wavy” and that’s not the look I was going for. I used a straight stitch and stitched near the crease, all the way around. Clipped the threads and pressed, once again, with a hot iron. I used the steam setting this time to try to get the edges nice and crisp. Overall these turned out to be as easy as I expected, and probably even cuter! Here they are against two different mats, with different rings. Quite easy to dress up or down. Even better, I’m sure, folded up in a picnic basket. I hope you enjoyed this tutorial! The napkins, as I mentioned, were made from fabric on clearance, so I was able to do all 9 for $13. Quite a steal, if you ask me. 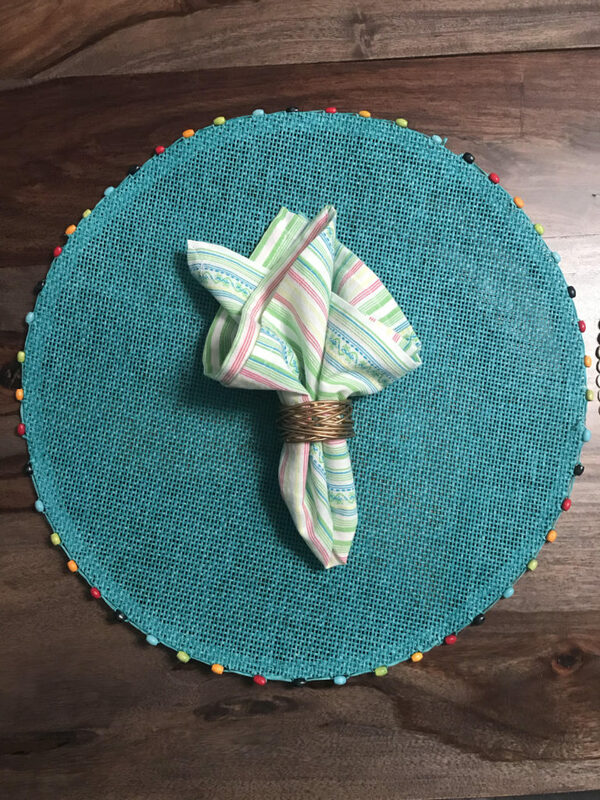 Easy, affordable napkins that you can make for every season or occasion. Thanks for following along today!